In our social media-saturated world, user-generated content (UGC) has reshaped the marketing landscape. It’s created a whole new frontier in which customers are invited and encouraged to join the conversation by sharing their experiences. Effectively utilizing UGC is becoming increasingly critical to any marketing strategy, especially among Millennials, who tend to spend up to 18 hours a day with various forms of social media. Studies have shown that Millennials trust UGC more widely and willingly than any form of traditional advertisements. They have more trust for peer-to-peer conversations, customer reviews, and social media posts than company-generated content. The power of UGC lies in its transparency and authenticity: consumers trust a company that allows their voices and opinions to be heard, and that environment of trustworthiness ultimately leads to more conversions. Why does consumer-generated content convert? To put it simply, hearing from another customer who made an impartial and organic connection with a company is vastly more effective in generating interest than hearing from the company itself. More and more frequently, purchase activity hinges on the social proof of UGC helping to seal the deal. 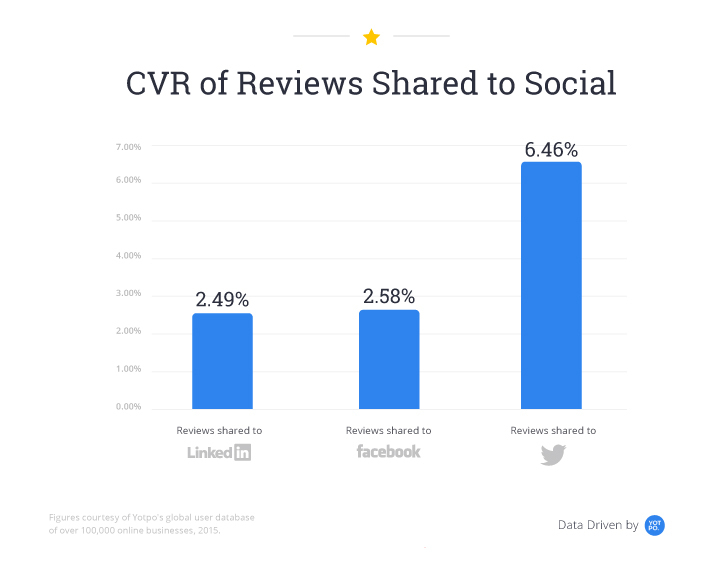 Yotpo data scientists found when reviews are shared to social, the conversion rate is an average of 40% higher than the industry average for Facebook, 8.4 times higher for Twitter and 5.3 times higher for LinkedIn. What accounts for this high conversion rate? For one, UGC incorporates social proof to strengthen trust and increase engagement. This means that people on social are more likely to trust something a friend posted than a brand-sponsored advertisement. Trust is one thing, but just how does consumer generated content drive the conversions that matter, on social as well as on other marketing channels? When past customers are writing a review, they’re actively thinking about the positive experience they had with your brand, making it the perfect time to offer another great experience. This accomplishes a few things. First, customers are more likely to write a review. Plus, you get the explosive publicity of them sharing it with their friends & family (who are likely also in your target market, and happy to hear a recommendation from a friend). Additionally, they become a repeat customer when they come back to your store to use the coupon (and write another review, etc). Magento Enterprise Edition customer Pawstruck took a mobile-first approach to make it easier for customers to share their experiences with their products and also incented customers to share their experiences in the first place. When they started integrating reviews in their Facebook ads, they saw a 30.3% improvement in CTR (Click-Through Rate) and 33.6% reduction in CPC (Cost Per Clicks) costs. This means their CPA (Cost Per Acquisition) is five times lower and their unique CTR is three times higher. Again, it’s difficult to find another method to increase your ad results by this much. The numbers speak for themselves. We’ve also found across our customer base that adding reviews to social media marketing doesn’t just improve ad ROI, but also drives more traffic. Sharing reviews on social media increases Twitter traffic by 26% and Facebook traffic by 6%. There’s no question that a healthy stream of positive customer reviews is a huge piece of the user-generated content pie. It may be the oldest tactic in the book, but its staying power speaks for itself. Aimee (@aimeemillwood) manages the Yotpo blog, where she writes about marketing, growth, and engagement. Yotpo is a Magento Gold Partner and leading reviews solution that helps you get tons of reviews and use them to generate qualified traffic and more sales. Over 50,000 stores worldwide use Yotpo to get dramatically more reviews. The tool Yotpo developed to easily create ads from reviews is so great, in fact, that Facebook themselves did a case study on it. Furthermore, it’s the first time they’ve done a case study on a vendor instead of a business using Facebook Ads.